A Cambridge University museum has reopened to the public following a £1.8m upgrade. The Museum of Archaeology and Anthropology on Downing Street had been closed for 18 months while work to upgrade the building was carried out. Curator Mark Elliott said it was a "radical transformation" and contained "everything, everywhere, ever". The museum holds about one million items from around the world, as well as many telling the history of Cambridge. Artefacts on show range from the oldest - a 1.8 million-year-old chopping tool from Tanzania, to the newest - a Perspex sculpture created by a Maori artist and completed earlier this month, in time for the reopening. The rarest object in the collection is a Sufi Muslim snakes and ladders board, one of only four known examples and the only one made of wood (the others are made of parchment or paper). One of the new exhibitions contains artefacts exploring how death and burial have been treated by different cultures through the ages. 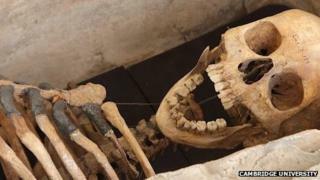 It includes the "Arbury coffin", containing the skeleton of a Roman woman aged 40 to 55, encased in lead and stone. The coffin was found by builders working on a new housing estate in Arbury, north Cambridge, in the 1950s. As well as the body, the coffin contained the skeletons of a mouse and a shrew. The woman's ankle bone had been gnawed by the mouse. The coffin was on display in the museum at the time Sylvia Plath was a student at the university in the mid-50s, and is believed to have been the inspiration for her poem All the Dead Dears. During the museum's closure, the ground floor was entirely refurbished and a new public entrance on Downing Street was created. Previously, visitors had to use a departmental entrance at the rear of the Victorian building. "This is now the world in Cambridge," Mr Elliott said. "Every one of the objects tells not just one story, but many stories." Entrance to the Museum of Archaeology and Anthropology is free.